Four days after the June 2016 Pulse nightclub shooting in Orlando, then-U.S. Rep. Corrine Brown descended the stairs of Air Force One alongside President Barack Obama. A month later, Brown cast her vote as a superdelegate for Hillary Clinton’s nomination for president. But the days of hobnobbing with the powerful are over for the 71-year-old Jacksonville Democrat, whose fall from grace was complete Monday when she emerged from a limousine-style minibus at the federal prison in Sumter County to begin serving a five-year sentence for fraud and other crimes. Brown, who served 24 years in Congress before her defeat in 2016, was sentenced last month for using about $800,000 meant for poor students to pay for Bahama vacations and a Beyoncé concert and to pad her own bank accounts. At the Coleman federal correctional complex — the nation’s largest with more than 6,600 prisoners — she will spend her days at the same complex that houses notorious criminals such as convicted gangster James “Whitey” Bulger, 88, who spent 16 years as one of the country’s most wanted fugitives, and Texas tycoon Robert Allen Stanford, 67, convicted of running a $7 billion Ponzi scheme. Bishop Kelvin Cobaris, lead pastor and founder of The Impact Church in Orlando and Brown’s spiritual adviser, said she was accompanied by family to the prison about 50 miles northwest of downtown Orlando. 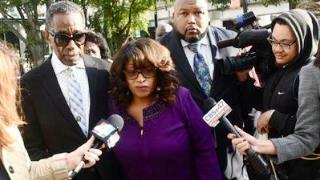 Ex-congresswoman Corrine Brown walks into Federal Court accompanied by pastor Rudolph McKissick, Sr. Brown appeared in Federal Court to be sentenced on fraud charges Dec. 4, 2017. The low-security prison camp is separate from the rest of the correctional complex that has three security levels — high, medium and low. There are no walls or fences at camps, and most inmates are serving five to 10 years for nonviolent crimes, said Larry Levine, director of Wall Street Prison Consultants, which helps incoming prisoners adjust to their new confinement. Because doors are often not locked, the inmates are subjected to multiple headcounts day and night. Levine, who did not work with Brown, said he is certain inmates will be wary of their new politically connected prisoner. Brown will wake at 6 a.m. on weekdays to wait in line for the bathroom and then for breakfast. Afterward, she will tidy her room and the small locker “that is her existence,” where she keeps all her possessions, said Levine of Los Angeles. Brown likely will do clerical or janitorial work during her days at the prison camp, where she will be held with 391 other female inmates, he said. Brown will work until 10 a.m. before a two-hour lunch break, after which she will resume work until about 4 p.m. Prison staff will assign her to one of the jobs in cooking, maintenance, cleaning or clerical work. Those first 30 days for Brown will be spent living in the multipurpose room, or “fishbowl,” said Holli Coulman, a consultant at Wall Street Prison Consultants who served 21 months for wire fraud. The former congresswoman’s chief of staff, Ronnie Simmons, began a four-year sentence for his conviction on similar charges in the same case this month in Maryland. In 1992, Brown and two others became the first African Americans from Florida elected to Congress since Reconstruction. Her sprawling 250-mile-long north-south district spanned 14 counties, including portions of Orange, Seminole, Lake and Volusia. She unsuccessfully challenged a new map approved by the Florida Supreme Court that shifted it to an east-west district, stretching from Tallahassee to Jacksonville, on grounds that it violated the Voting Rights Act by reducing the black voting-age population from 50 percent to 45 percent. She was defeated in the 2016 primary by former state Sen. Al Lawson, who went on to win in the general election. During her time in office, Brown worked to secure local spending through earmarked bills and met with Justice Department officials to investigate the 2012 Trayvon Martin shooting in Sanford, saying the 17-year-old’s death was a hate crime. Brown could be released on good behavior after serving four years and three months, Levine said. She is appealing her conviction and sought to remain free on bond during that process, but U.S. District Judge Timothy Corrigan denied her request.